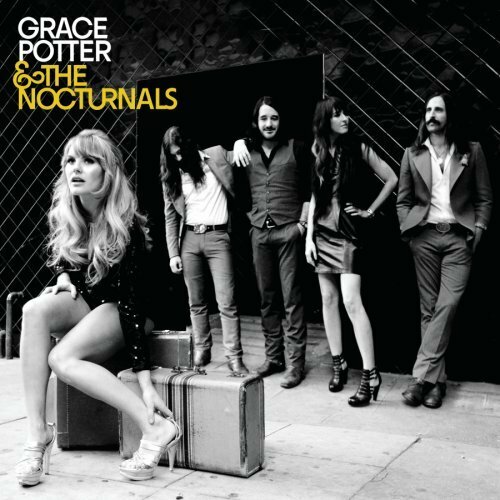 Grace Potter and the Nocturnals, the band's self-titled release jumps off a cliff with its opening track, Paris (Ooh La La), a remake of the hidden track If I Was from Paris from their prior album, This Is Somewhere. At least, that's what it feels like - a rush of adrenalin followed by fun beat that gets one moving to the song. With their fourth album, the Nocturnals have undergone some changes. Last year, the band lost its original bassist, Bryan Dondero over some creative differences, which in turn allowed the band to bring bass player Catherine Popper, as well as rhythm guitarist Benny Yurco. With the new lineup comes a new sound for the Nocturnals. While this isn't something that's really unexpected (Original Soul and Nothing But The Water differed a bit, while This Is Somewhere also pulled away from their sound for a more mainstream classic rock sound and feel), it's by far the bigger departure for the group, sound wise. The guitar work is far bolder throughout the album, the lyrics more evocative and overall, this effort feels far more personal and intimate; Goodbye Kiss hits the listener right to the core, much like Apologies did in her last album. Most of the songs on the album really work well with the lyrics, coming out of the speakers with a nice, easy flow, songs like Oasis, Medicine and One Short Night. Moreover, where her last album felt like a classic rock homage, this one veers into a new direction, inserting funk and soul into the album once again. Hot Summer Night exemplifies this sound excellently, as does That Phone, Oasis and Goodnight Kiss, which gives the album and band a bit of new flavor, which has been seen in some of their reworking of their older songs in recent concerts. There are some anomalies here though: Tiny Light feels free and light, with a real '70s feel, while Things I Never Needed feels a bit like a country ballad. Paris (Ooh La La) is in a class of its own, but then again, it's always been. Like her last album, there is a good mix between the tone and feel of the album between songs - Paris starts off with a rush of energy, followed by Oasis and Medicine, but songs like Tiny Light and Colors draw the lights down for a closer, slower and more personal feel. This variety and range of sound is a trademark of the Nocturnals, especially at their concerts: They can jump, very easily from slow to fast, bringing out a wall of sound and rhythm. Grace Potter and the Nocturnals is a further effort towards this image, and it does so wonderfully. The strongest part of the album, and the band's music in general, has long been with their lead singer, the wonderful Grace Potter. Surrounded by the new sounds, musicians and songs, her voice is the one thing that really carries the band along, along with her fantastic lyrics. This album contains a number of gems from the group, which both highlight her songwriting and vocal talents: Oasis, Medicine, Tiny Light, Only Love, One Short Night, That Phone and Hot Summer Night, all fantastic songs that fit well within the growing catalog of songs that the band has been producing steadily over the past couple of years. While the sound feels different, Potter is the connecting point between albums, and while I focus on her voice and lyrics, a lot of the differences fall away between her old and newer songs. What Grace Potter and the Nocturnals does for the band, however, is give them an incredible amount of face time with a sound that fits very well with the mainstream rock and roll scene, but there's just enough color and texture to the songs that they produce to push them over the top of quality. Where her last album was the breakthrough into the popular markets, this album feels like they've regained some of their footing and are beginning to push back with their own sound, which makes this album extra special. While I really loved This Is Somewhere and still constantly listen to it, it felt like there was something missing at points – looking back, it felt as though the band was reaching for something, and found a good compromise. Listening to this album though, it feels much like the color has flooded back into the room, and the sound's been turned up as high as it'll go. The Nocturnals have found what they’ve been looking for. At the end of the day, Grace Potter and the Nocturnals is simply a stunning album from a stunning band. Not content to recycle their prior successes, the band has once again reinvented themselves to attain a better, brighter and richer sound throughout their new album, with songs that are truly inspiring, interesting and most importantly, fun to listen to. It’s clear that they’re on the upwards path, but this new lineup shows that the group is maturing, and they’re bringing out a whole new sound that will really make heads turn.